Now just in case you are looking for a red coffee grinder to go with your red coffee maker! This grinder is priced at under $20 (just!) and will be a contemporary addition to your kitchen counter top. It gives you 3 grind settings and allows you to choose how much coffee you want to grind at any one time – from 4-12 cups ( in 2 cup increments). The grinding chamber is removable so it makes it easier to fill it without making a mess – sounds like it was made for me! It even has a cleaning system that cleans the grains from inside the chamber. 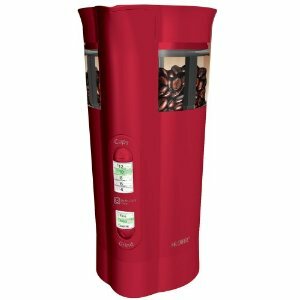 This red coffee grinder measures 4 by 3-1/2 by 7-4/5 inches. Previous articleAre You an Angel or a Devil? In Coffee Cups at Least! Next articleBamboo Hardwood Flooring – Eco Friendly and Friendly on the Eye!